Our True North Network experienced victory on Monday. Claudia Portillo, an undocumented Arcata mother of four who has been in ICE Detention in Bakersfield for the past seven months, was granted release on bond. Claudia's family and friends inside the courtroom at her bond hearing. Claudia was present via video chat and can be seen on the screens. This came at the end of just over a week of the North Coast community encountering, understanding and being moved by Claudia’s story and her struggle. Residents met her family and close friends at our Encounter event in Arcata on June 10th, and they had the chance to meet Claudia herself via video from the Mesa Verde Detention Center. Just two days later, Claudia’s case moved quickly and she was scheduled for a bond hearing on Monday, June 18th. With less than a week to prepare, our network organized to be at her hearing in San Francisco. Our community stepped up and raised almost $20,000 toward her bond and her travel back to her home. A local small business, Los Bagels, agreed to donate food for our journey, and volunteers came forward to drive vans loaded with North Coast residents determined to bring Claudia home. Since execution of the Administration’s new Zero Tolerance policy was ordered in April, more than 2,300 children have been separated from their parents at the US-Mexican border and held in jail-like conditions. Additionally, over the past year, the amount of migrant children that the United States has taken into government custody has reached nearly 11,000. The inconvenient truth is that our nation has a long and sordid history of breaking up families: during slavery children were taken and divided from their parents; Native American children were taken by the government and could be sent thousands of miles from their homes. Unfortunately, we are turning another chapter in a long line of immoral and unjust policies that separate and destroy marginalized families. The President has rescinded his action with a new Executive Order, but that only delays this inhumane situation: A family will remain together in custody until outcome of their court case, and then the children can be divided from their parents. It also asserts an intention to detain families indefinitely, in opposition to current judicial precedent. Our network has witnessed the pain that a family experiences when a daughter, sister, mother, cousin, aunt and friend is jailed and separated from those who love her. Through our relationships with Claudia and her family, we empathize deeply with the pain of isolation and the cruelty of immigration detention. We opened our hearts and put our boots on the ground for Claudia, and this time we were able to help bring a loved one home. We need to do the same for other families who are being ripped apart by the broken immigration system and callous government officials. While Claudia will likely be home with her family by the end of this week, thousands of children and parents will remain separated, alone and afraid. The whereabouts of their loved ones will remain unknown. As an organization dedicated to advancing immigrant rights, we will continue our fight for them. Now is the time for all people of goodwill and a thirst for justice in our North Coast Community to stand up and join us in this fight! 18 June 2018 (San Francisco, California) — Claudia Portillo, an undocumented Arcata resident and mother to four daughters, has been granted release on a $12,000 bond after seven months of immigration detention, and her community is arranging to pay for her release. The North Coast community has advocated for Ms. Portillo’s release both at home in Humboldt and Del Norte counties and in San Francisco with community events, online fundraisers and direct support to her family. 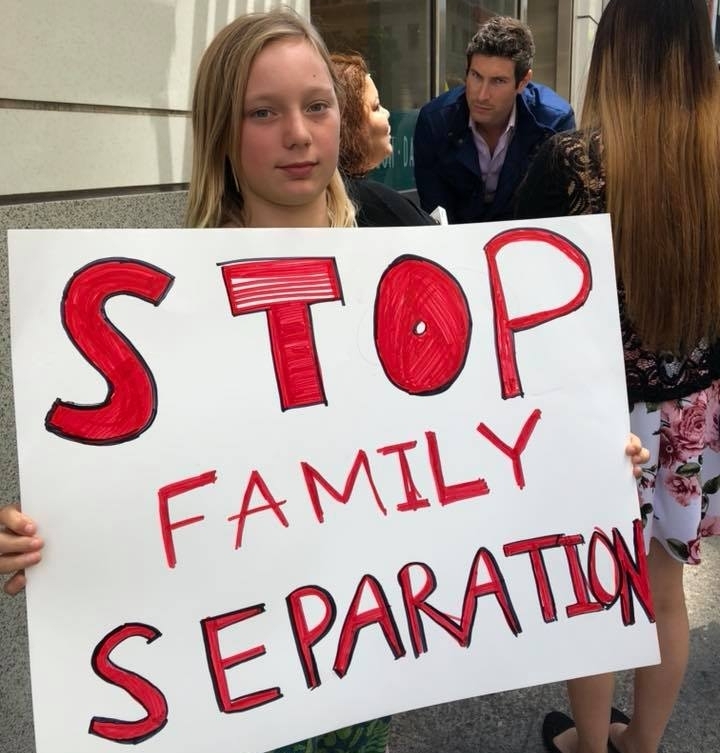 At 6:00 AM on Monday, June 18th a convoy from Humboldt and Del Norte Counties embarked on a six-hour-long drive south to San Francisco Immigration Court demanded the return of their undocumented friend and neighbor, Ms. Portillo. After hearing her plea, Judge Patrick S. O’Brien granted her release on bond. He is one of only 334 immigration judges nationwide struggling to overcome an average backlog of 1,849 cases per judge. A 2017 article uncovered that only 15 percent of people in detention are represented by an attorney in San Francisco's immigration courts. Judge O’Brien stated in the hearing that while he was granting Ms. Portillo release on bond, the Department of Homeland Security has the ability to appeal his ruling to delay her release. Ms. Portillo was unexpectedly detained during a routine check-in appointment in November 2017 and imprisoned her 555 miles away from her four daughters in the privately owned Mesa Verde ICE Processing Facility in Bakersfield, CA. Just 33 years old, Ms. Portillo was born in El Salvador, but has lived in the United States from age seven. Her four American daughters, four rescued dogs, mother, two sisters, nieces, and brother await her return to Arcata, CA, where she has lived for the past four years. “My sister has been stuck in detention for seven months. She has missed her daughters’ birthdays and graduations.” Explained Ms. Portillo’s sister Jenny Ventura. “Claudia is a strong, vital part of our community and is enduring something unthinkable for most of us… waiting in detention for more than 7 months! This is wrong! Claudia is not a criminal. She is a lovely human being who deserves better than this.” urged Mckinleyville, CA resident and True North Organizing Network Leader Lisa Enge. Among the community groups that for Claudia Portillo’s return are True North Organizing Network, Arcata United Methodist Church, Catalyst Church, Humboldt Move to Amend, Centro Del Pueblo, among others. Los Bagels donated breakfast and snacks to the convoy that traveled from Humboldt County to San Francisco. Congressman Jared Huffman, who represents Ms. Portillo’s congressional district, wrote a letter to Judge O’Brien requesting her release. Over the past week, a community fundraiser has raised more than $8,000 in online and in cash donations, and both individuals and community groups are arranging to cover the rest of the $12,000 cost of her release. Claudia may be home with her family this week. Jenny Ventura: Claudia’s youngest sister. Eliada Bernal Portillo: Claudia’s eleven year old daughter. Brenda Urueta. True North Organizing Network’s Humboldt County Organizer and campaign leader. Pastor Bethany Cseh, True North Organizing Network community leader and #FreeClaudia campaign volunteer. Other True North Organizing Network community leaders and #FreeClaudia campaign volunteers can be identified upon request. True North Organizing Network: Claudia’s Case. Photos from community gathering to plan Free Claudia campaign Sunday, June 10th. 12/27/2017 The Eureka Times-Standard. Judge denies motion in fight to keep detained Arcata mother in U.S.
13 June 2018 (Arcata, California) — At six am on Monday, June 18th a convoy from Humboldt and Del Norte Counties will embark on a six hour drive south to San Francisco Immigration Court to demand the return of their undocumented friend and neighbor Claudia Portillo, Arcata mother of four. During a routine check-in appointment in November 2017, Immigration & Customs Enforcement agents unexpectedly detained Ms. Portillo and imprisoned her 555 miles away from her four daughters in the privately owned Mesa Verde ICE Processing Facility in Bakersfield, CA. Just 33 years old, Ms. Portillo was born in El Salvador but has lived in the United States from age seven. Her four U.S. daughters, four rescued dogs, mother, two sisters, nieces, and brother await her return to Arcata, CA, where she has lived for the past four years. As soon as the news filtered out on Tuesday, June 12, community volunteer Billy Cook launched a GoFundMe campaign to raise funds for Ms. Portillo’s bond. “We hope seeing Claudia’s neighbors and family drive 279 miles to San Francisco on a work day to plead for her return will help Judge O’Brien agree this is an easy ‘yes’,” explained Pastor Bethany Nass Cseh of Arcata United Methodist Church and Catalyst Church in Arcata. Two convoys from Humboldt County will depart promptly at 6:30 am Monday, June 18th from in front of both the Arcata and Eureka locations of Los Bagels, a popular local bakery and cafe and donor of food for the journey. They will gather with clergy and allies at the San Francisco Immigration Court house at 12 noon that day, before filing into Ms. Portillo’s 1 pm hearing. Judge Patrick S. O’Brien, who will hear Ms. Portillo’s bond plea, is one of only 334 immigration judges nationwide struggling to overcome an average backlog of 1,849 cases per judge. A 2017 articleuncovered that only 15 percent of people in detention are represented by an attorney in San Francisco's immigration courts. Among the community groups mobilizing for Claudia Portillo’s return are True North Organizing Network, Arcata United Methodist Church, Catalyst Church, Humboldt Move to Amend, Centro Del Pueblo, among others. El mensaje continúa en español a continuación. 19 April 2018 - At approximately 12:00 pm on Wednesday, April 18, the Humboldt County Rapid Response Hotline received a call from the United Farm Workers of America that someone had been detained by Immigration and Customs Enforcement (ICE) in Bayside at 7:30 am. The dispatcher was told that the spouse of the detainee had called them and that he was already in transport to a detention facility in San Francisco. The United Farm Workers also advised the Rapid Response Network to be on alert for other potential ICE enforcement activity. The network is still seeking further information and is ready to respond in the event of further actions. We encourage our community to call (707) 282-5226 to receive immediate support if confronted by ICE in your home, at your workplace, on the street, etc. “The Rapid Response Network is a community based effort that works to bring awareness to the grotesque tactics and enforcement actions used by ICE. We work to train community members in being legal observers if and when ICE comes into Humboldt County. We also work on being able to provide legal resources and support to those affected by ICE.” - Emely Velez, Fellow with ACLU of Northern California. Since May of 2017, leaders of True North Organizing Network in partnership with ACLU of Northern California have been building a Rapid Response Network in Humboldt County to address our immigrant communities’ fears of separation from their families and the human rights violations that have occured at the hands of ICE officers. As part of the Rapid Response Network, 80 volunteers from Mckinleyville to Loleta have been trained in Know Your Rights and how to observe an ICE raid. When the network is activated, volunteers who live near the reported site of ICE activity are dispatched to observe and document so as to protect constitutional and human rights of our community members. The network is also providing support to families after the fact, when affected by an immigration enforcement action. 19 de abril de 2018 - Aproximadamente a las 12:00 pm miércoles, el 18 de abril la línea caliente de la Red de Respuesta Rápida del condado de Humboldt recibió una llamada de la Unión de Campesinos que alguien había sido detenido por Inmigración y Control de Aduanas (ICE) en Bayside a las 7:30 de la mañana. Le dijo a la despachadora que la esposa de la persona detenida había llamado y que ya estaba en el transporte a un centro de detención en San Francisco. La Unión de Campesinos también aconsejó a la Red de Respuesta Rápida para estar en alerta por otra actividad potencial de acciones de ICE. La red sigue buscando más información y está listo para responder en caso de nuevas acciones. Recomendamos a nuestra comunidad que llamen al (707) 282-5226 para recibir ayuda inmediata en caso de enfrentarse por el ICE en su casa, en su lugar de trabajo, en la calle, etc. “La Red de Respuesta Rápida es un esfuerzo basado en la comunidad que trabaja para hacer tomar conciencia de las tácticas grotescas y acciones de aplicación utilizados por el ICE. Trabajamos para capacitar a miembros de la comunidad en ser observadores legales, siempre y cuando el ICE entra en el condado de Humboldt. También trabajamos en ser capaz de proveer recursos legales y apoyo a los afectados por el ICE.”- Emely Vélez, Miembra de ACLU del Norte de California. Desde mayo de 2017, los líderes de True North Organizing Network en asociación con ACLU del Norte de California han construido una Red de Respuesta Rápida en el condado de Humboldt para hacer frente a los temores de la separación de sus familias y las violaciones de derechos humanos que han ocurrido a manos de agentes de ICE a nuestras comunidades inmigrantes. Como parte de la Red de Respuesta Rápida, 80 voluntarios de Mckinleyville a Loleta han sido entrenados en conocer sus derechos y la manera de observar una redada de ICE. Cuando se activa la red, los voluntarios que viven cerca del lugar donde hay presencia de ICE están pedidos a observar y documentar para proteger los derechos constitucionales y humanos de los miembros de nuestra comunidad. La red también está proveyendo apoyo a las familias después del hecho, cuando se ven afectados por una acción de inmigración. April 12th (Crescent City, CA) - On Thursday, April 26th from 5:45 PM to 8:00 PM, True North Organizing Network will host a public forum with the District 3 and District 4 candidates for the Del Norte County Board of Supervisors. The event, which will feature an information fair and include English to Spanish translation, refreshments, and childcare, will be held at Crescent Elk Middle School, 994 G St, Crescent City, CA 95531. True North invites the Del Norte community to participate in this public forum, as our District Supervisors make important decisions every day that shape life in Del Norte County. We will discuss issues such as water and the environment, public education, police accountability, homelessness and mental health, immigrant rights and more. The information fair will include tables from our regional Local Organizing Committees (LOCs), as well as our allies and other organizations. On the topic of civic engagement, True North leader Mike Tompkins says: "Del Norte County is a diverse community and our people have a variety of values and spiritual practices. For me, as a Christian, I am commanded by my faith to love my neighbor as myself. This means that I cannot ignore what's happening in the political, social and economic life of my community. As a result, I must be civically engaged in the community.” Mike also calls on the broader community to join him in being active in local politics, and invites Del Norte to the forum: “One person can't do it alone. It takes all of us working together to make our community an inclusive and thriving place both now and for generations to come. We all must be knowledgeable about where local candidates for office stand on important issues, and then use our knowledge as well informed voters. Candidates forums like this are crucial because they present an opportunity to accomplish that." True North Organizing Network is a registered 501(c)3 nonprofit organization and is not aligned explicitly or implicitly with any candidate or political party. While True North is working to promote civic participation including voter registration and education, we do not endorse, support, or oppose candidates for office. For more information, visit our website at truenorthorganizing.org.